What Is the Lead Domino? For example, let’s say your current focus is to get a new client for your start-up business and you’re trying to do so by building an email list, writing articles for your blog, updating social media to increase your reach, and running live events. Before you dive into any of those tasks, ask yourself which task is the lead domino? Building an email list, writing articles, and updating social media daily will get the word out about your business and will build trust with potential clients. They have the ability to earn you more clients over time. But, if your goal right now is to get one new client for your business, then running a live event may be the lead domino. It’s the domino that might be the scariest and take the most work: you have to plan the event, book the space, solicit attendees, prepare your presentation, promote and market it, and tackle day-of logistics. But, by getting to see you in person at an event, your potential clients get to experience working with you. And the chances of one of them turning into a client — so they can keep working with you — is much greater. And, once an event leads you to one new client, the other tasks have less urgency behind them. You have money coming in, you’re doing what you love, and you can continue those other tasks to bring in more clients over time. Attendees will start following you on social media, subscribing to your list, and start engaging online. Maybe the content from your live event can be repurposed into multiple website articles, saving you time creating content from scratch. The lead domino made the other dominos feel (or actually be) easier. Sure, it may take longer to create an email template you can use over and over again or to automate a spreadsheet, but will it make all your tasks easier for weeks and months to come? Ask yourself if there’s some task you could do that is, or isn’t, currently on your task list that would make some of your tasks easier or irrelevant in the days, weeks, or months to come. 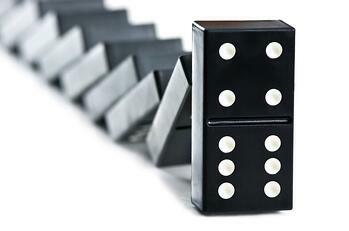 Why Does “Finding the Lead Domino” Increase Productivity? In addition to making some tasks easier or irrelevant, there’s a bigger way the lead domino idea helps you be more productive. It allows you to focus. Instead of constantly worrying about multiple tasks all with the same priority, it forces you to realize that one of them is, in fact, higher priority than the others — because one of them will make your life easier or has the potential for bigger results. And it allows you to focus on that task without worrying about the others. So what is your lead domino? If you found yourself nodding your head along to this article, take the time now to do the hard work of planning, thinking about your tasks, and choosing a lead domino. Then, make it a part of your everyday: your business, work life, and personal life.